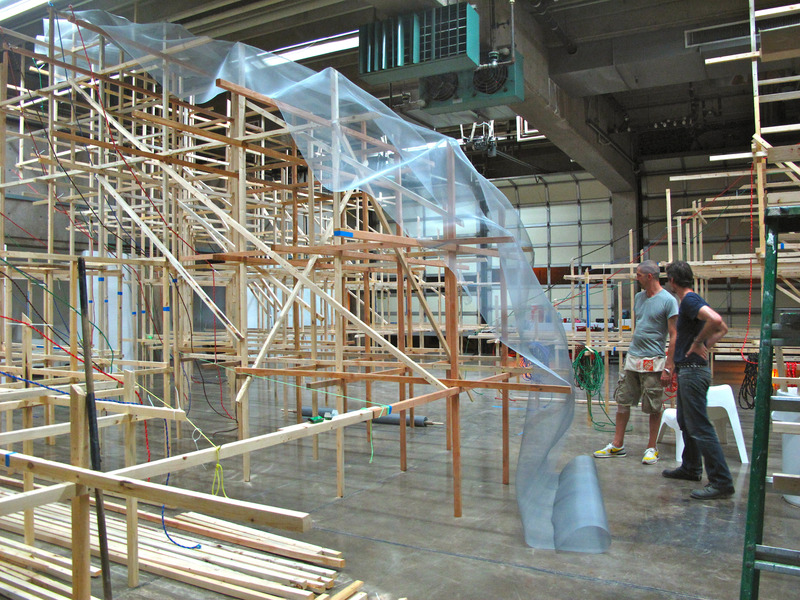 I must extend my deepest gratitude to the extremely hardworking and fellow artist, Henry Kerr. 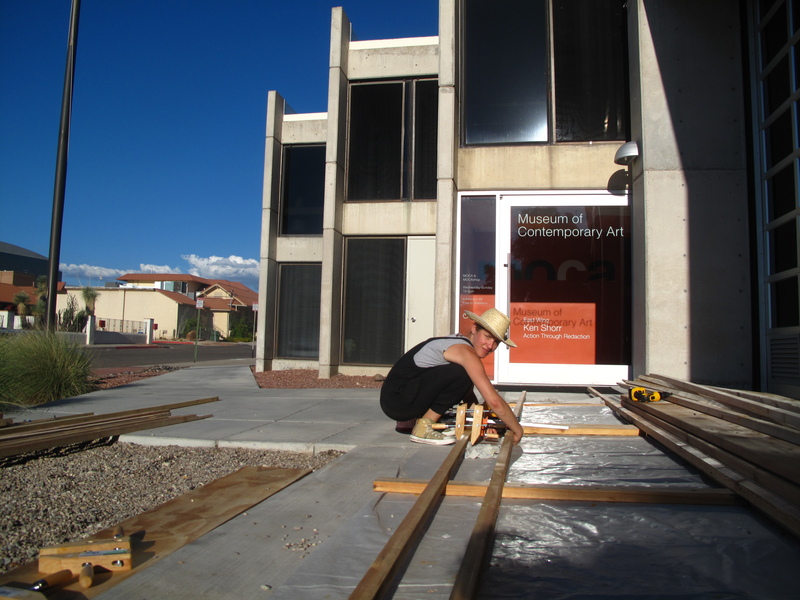 I could not have completed Untitled (Basin and Range) at MOCA Tucson without him. He has been with me from constructing the first pancake until we pour the last paint drop. 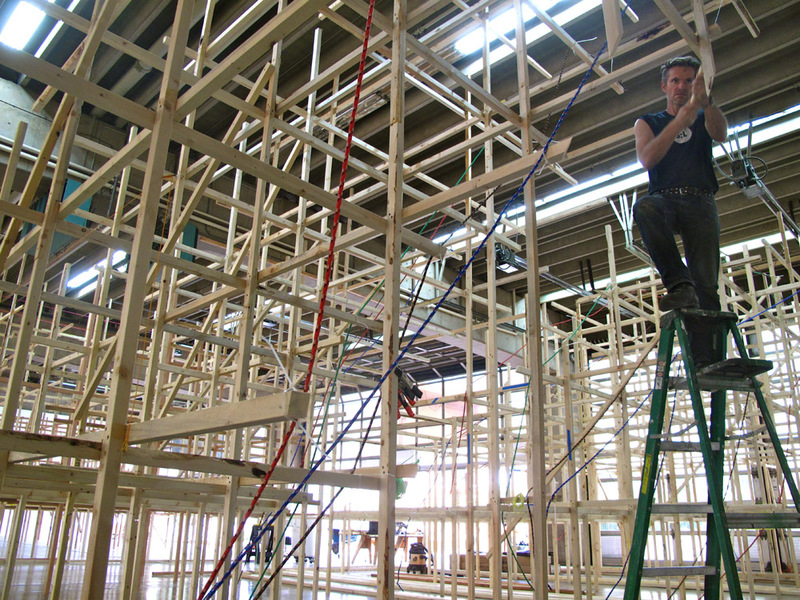 He has put endless hours into this project and all without a day off. Cheers to you, Henry! I would also like to mention that Henry created this site-specific painting at the Museum in the Artist in Residence living room in 2011. 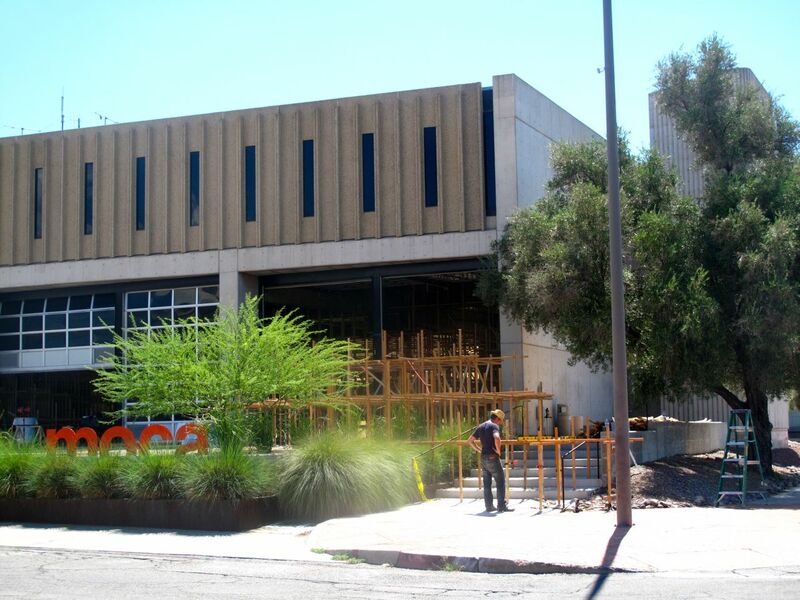 This piece, Live, measures 40 feet wide by 10 feet tall and has made my stay extra special, knowing that a dedicated and talented artist such as himself has given a personal touch to the unique and welcoming environment that is MOCA Tucson. I am so lucky to have a wife like Florencia Minniti. She has been with me in Tucson since early September, helping the crew with just about everything. Thanks for all your hard work and support! 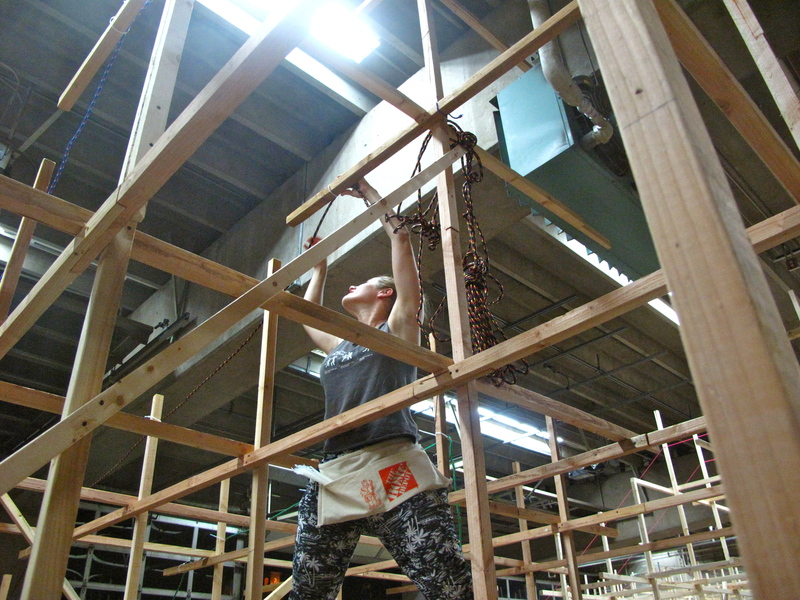 Now that the wooden grids have been carved, it’s time to drape the mesh for Untitled (Basin and Range). 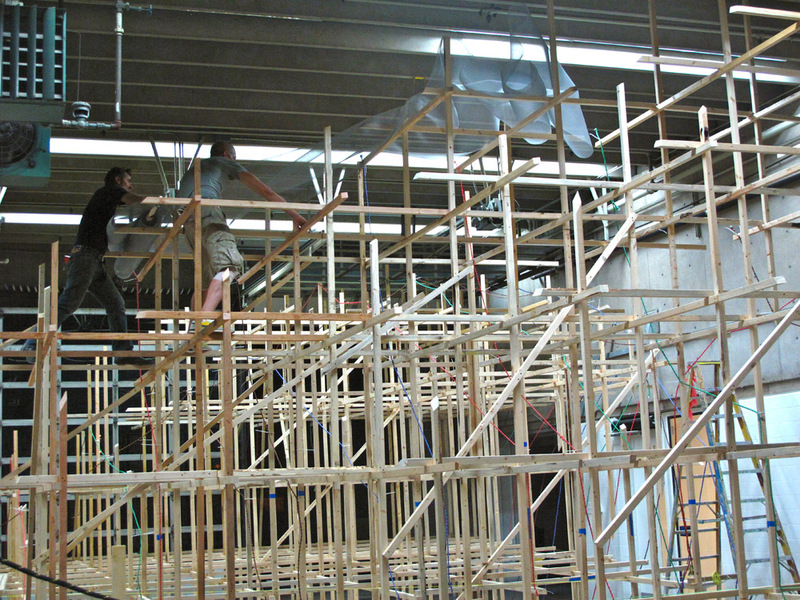 Florian and I climb to the top of the range and unfurl the one hundred foot roll of aluminum mesh. 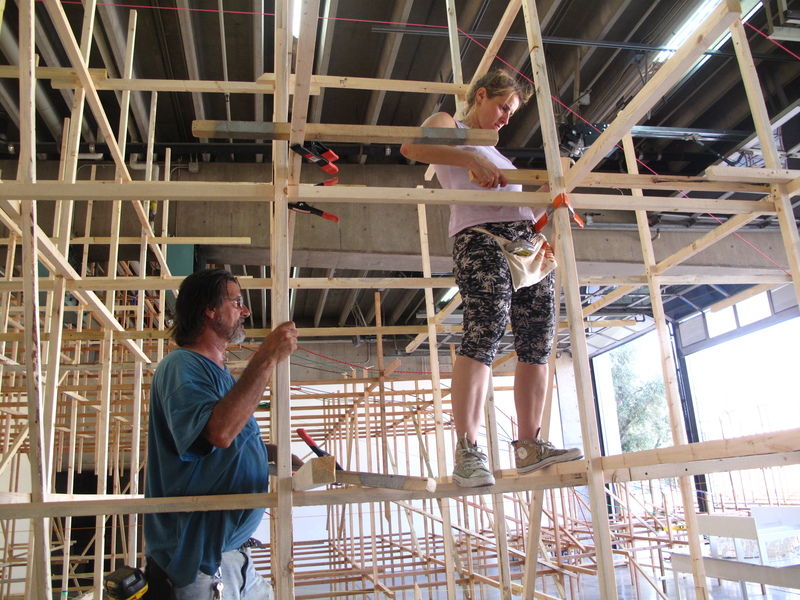 After finishing up the construction of all five of the ranges of Untitled (Basin and Range), it’s time to shape the wooden grids at MOCA Tucson. 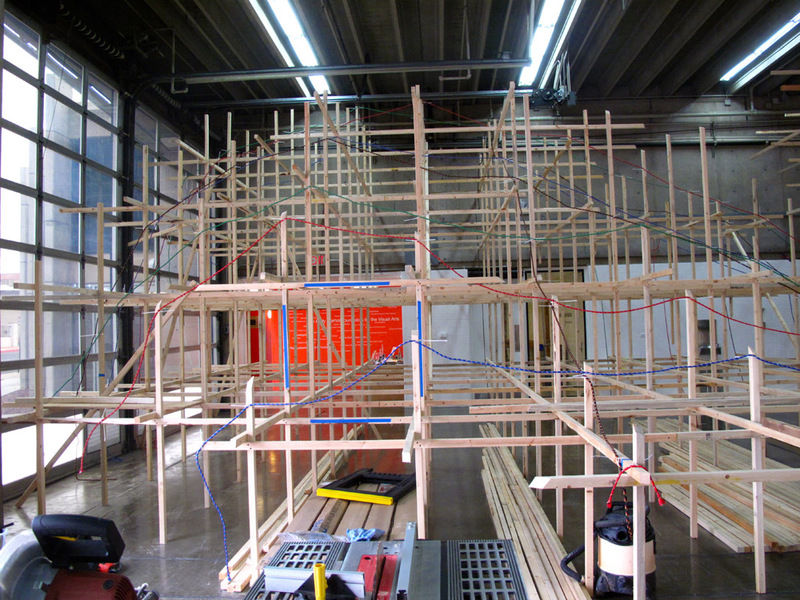 To create the shape, I lay ropes over the installation to inform me of the angle at which I should cut each piece of wood. This is an important step in my process because the next step involves draping the aluminum mesh over these angled points of the structure. 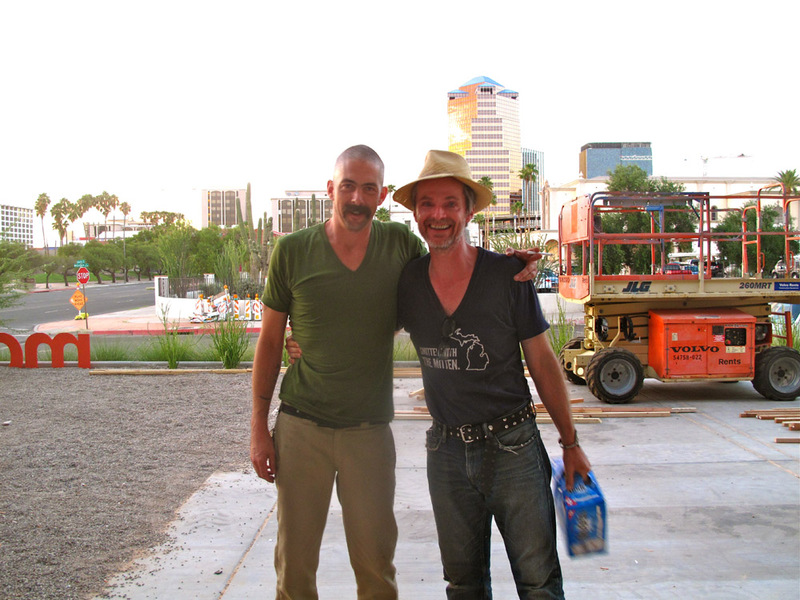 Since the completion of Range #5, my dear friend Florian Altenburg has arrived in Tucson. As you may know, he was an instrumental part of Allotropisms and Spire in 2011. 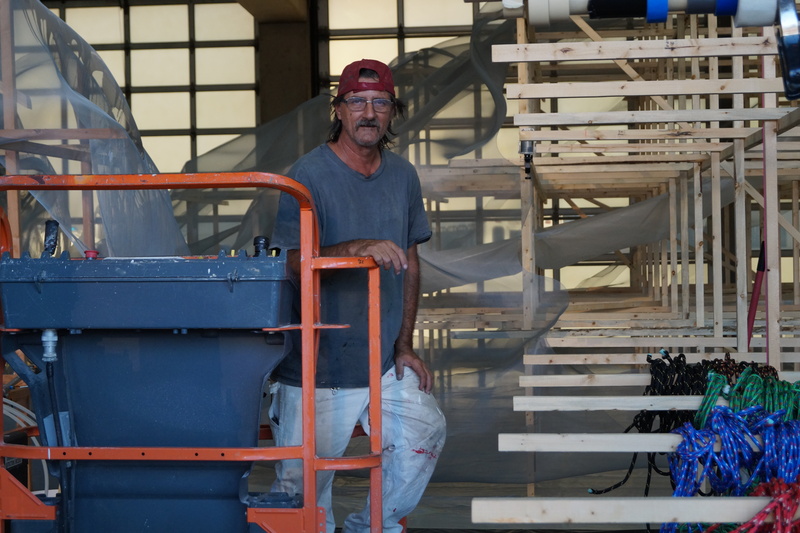 Now he’s back to work with the MOCA Tucson crew to help us complete Untitled (Basin and Range) with the draping of the aluminum mesh and clear paint. 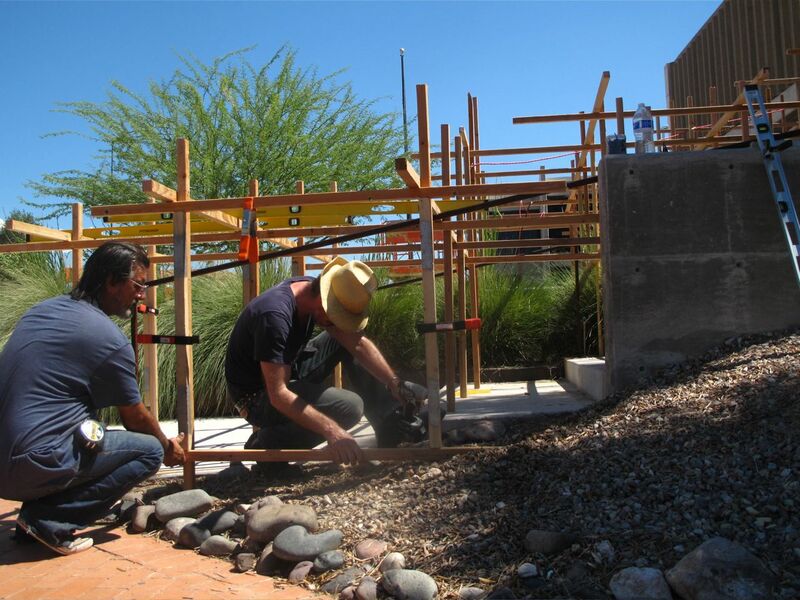 We have completed the construction of Range #5 for Untitled (Basin and Range) at MOCA Tucson. 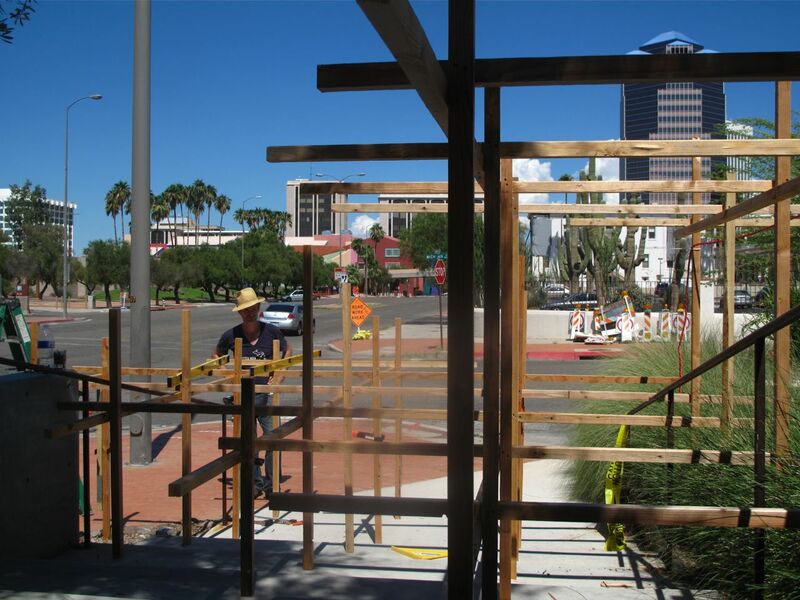 Range #5 starts on the Great Plaza, extends over the gravel and spills out to the bottom of the stairs, meeting the street curb of the city of Tucson. 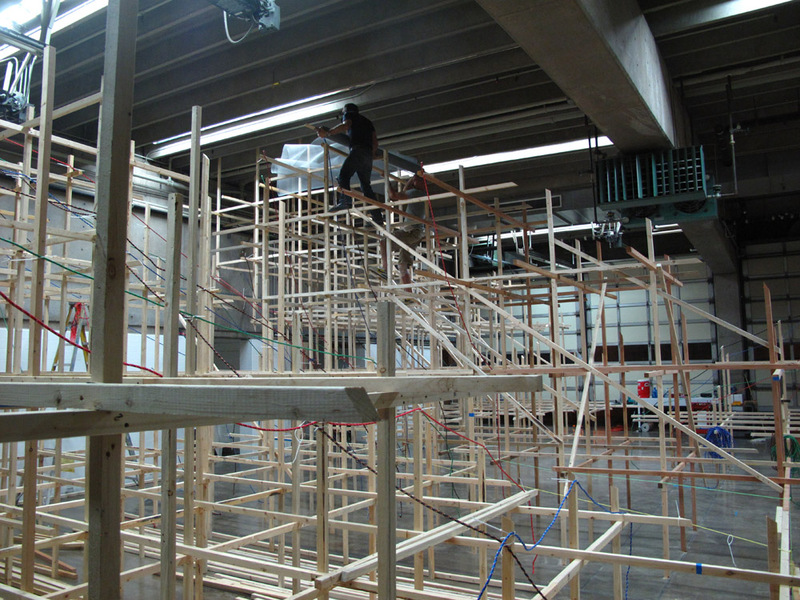 The staircase will be closed and people have to go back inside to the museum to exit the exhibition. I think that the Great Plaza will be another sweet spot! 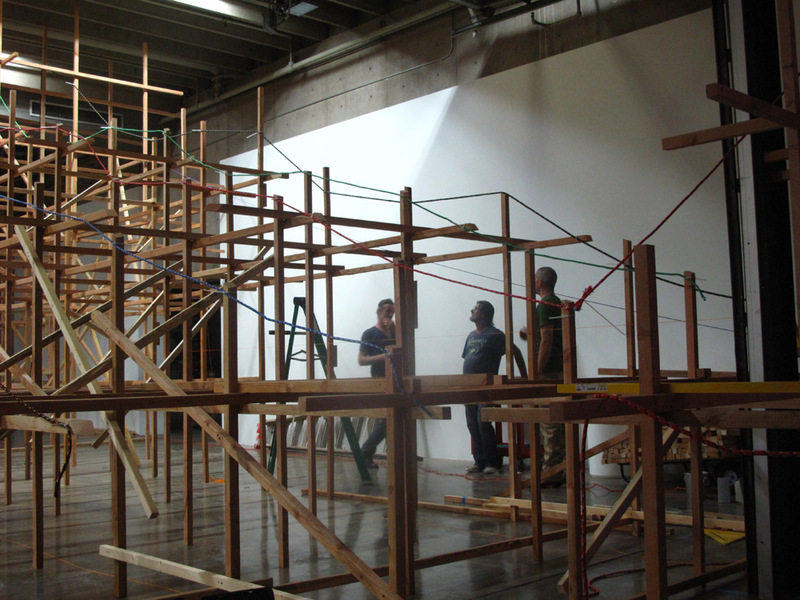 Range #5 of Untitled (Basin and Range) at MOCA Tucson is progressing! 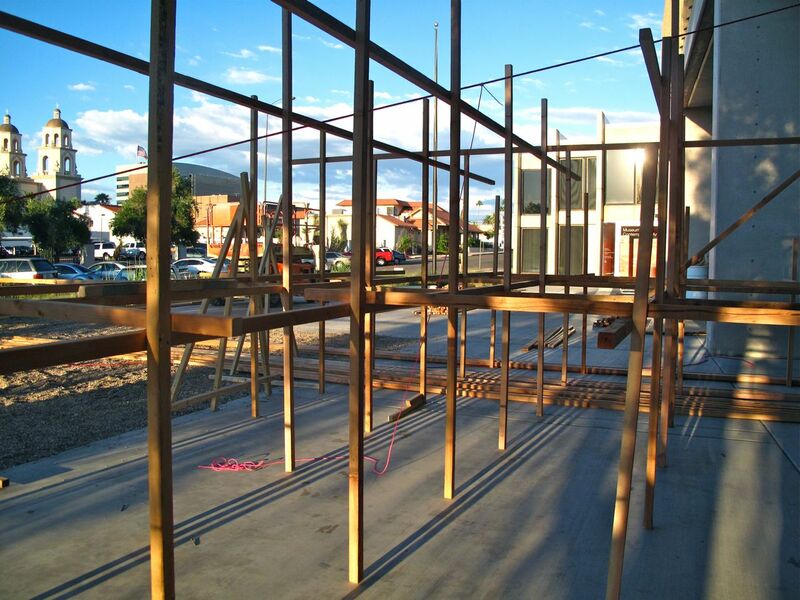 The vertical beams have reached across the Great Plaza to the gravel. 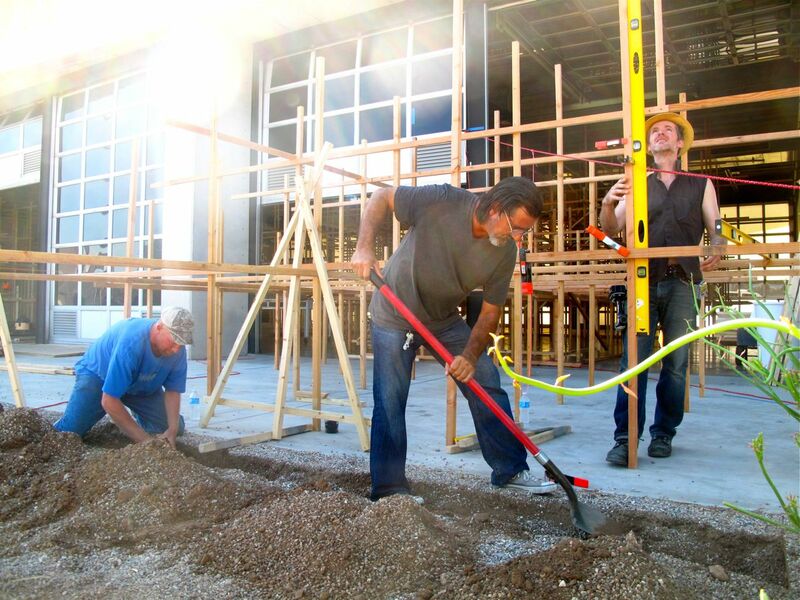 At the gravel, we are digging trenches to install and secure horizontal beams where the piece will continue and then disappear under the ground. The shadows the sunset casts are absolutely beautiful over the plaza.